Even if you’re not a fan of sweatshirts, you’re likely to find this one irresistible. 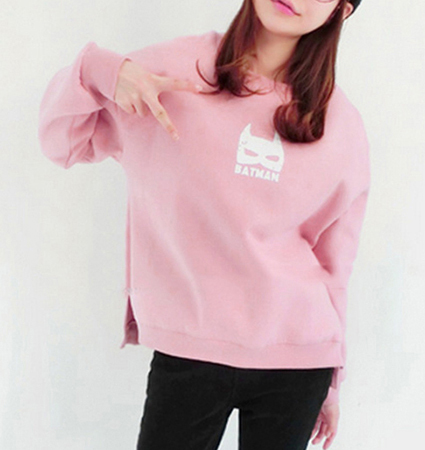 Soft pink “Jonnette” cotton polyester blend knit sweatshirt is fuzzy inside, smooth outside. Long sleeves fall to the wrist and boast matching rib knit cuffs. The rounded crew neckline also has rib knit trim (a nice touch with the pull over style of this pink sweatshirt). This generously sized sweatshirt ends at the hip and has a rib knit bottom band. The best part, though, is the cute white kitty face transfer on the left upper chest. Talk about having a “cattitude”!